Over the years, I’ve purchased many, many Christmas gifts for my family. Usually the gift is appreciated, put away and forgotten. 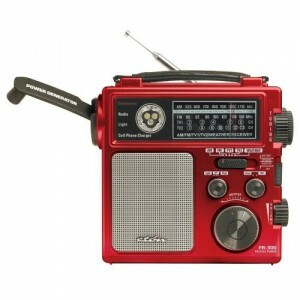 Last Christmas, I decided to give everyone in my family something useful, emergency radios. I must admit that there were confused looks on the faces of my family members when they opened these radios. Shortly after Christmas last year, a snow storm blew into northwest Arkansas, downing powerlines and phonelines and cutting off electricity for over a week. Turns out that the little emergency radio was my grandmothers only link to the outside world! She built a fire in the fireplace to keep warm and used the radio with it’s hand cranked battery charger to listen to the weather broadcasts and radio stations that were still online. She used this communication to decide whether or not to stay in place or leave the house to seek help. Due to the broadcasts, she knew the power companies were hard at work getting the power back on and that it was only a matter of time before they got to her street. My grandmother admitted to me that she thought the gift was a little silly when she opened it but when the power when down, it became the most important gift I had ever given her.